Embark on a tour through the magical City of Brotherly Love. Discover fountains and flowers, pigeons and parks, steeples and skyscrapers, hot dogs and history. Let Lollipop the pony take you on a colorful adventure of learning and fun! 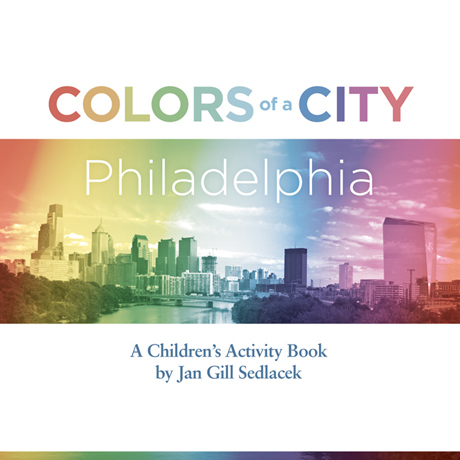 Written by teacher and special needs educator Jan Gill Sedlacek, Colors of a City: Philadelphia is an educational activity book for children featuring letters, numbers, colors, and more. For ages 3 to 8. Book #1 in the Colors of a City series. Jan Sedlacek has a B.S. in Elementary Ed/Special Ed and became certified at the graduate level from West Chester University in Pennsylvania. During the course of her career she has taught first and sixth grades, as well as primary and intermediate special needs students full-time. She directed a hippotherapy program at her farm for five years, summer camp programs mainstreaming specials needs children, and a church youth group. She has long been an advocate for children, striving to educate each one to his or her highest potential. She believes that when children know they are loved by God, they feel free to succeed in their endeavors. She and her husband Jarold raised two children, John and Joelle. John is a civil engineer, PE. Joelle was home-schooled by Jan and is currently a biology student at the University of Massachusetts. Jan presently resides in Elverson, Pennsylvania, where she continues to love and drive her pony Lollipop, as well as manage her company, Lollipop Inc., an online pony gear business that aims to help keep kids safe in the saddle.